Add to your customer base by adding Feather flag printing to your marketing! This personalised flag contains a wide surface area, perfect for designs containing more copy over visuals. With our huge selection of bases, you can mix and match enabling feather flags to be used in a variety of spaces! Feather flag printing helps get your business noticed! Personalised flags are ideal for use indoors and out, for cafes, car dealerships, theatres, beaches and museums. Feather flag printing is available in a variety of sizes to suit every message, choose from 2600 x 550 mm, 3200 x 600 mm, 4000 x 800 mm and 4900 x 850 mm. This size is the total height of the flag, including the pole. Simply select a size and upload an eye-catching design to start raising awareness for your business. Our Feathered flags are made from 110g/m² flag knit material, which has a mesh feel, and offers wind-resistance. 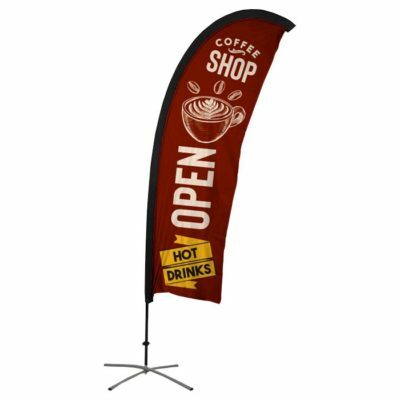 Flags are printed single-sided using our dye sublimation process, and come complete with a base, fibreglass pole and bag for easy assembly and transportation. 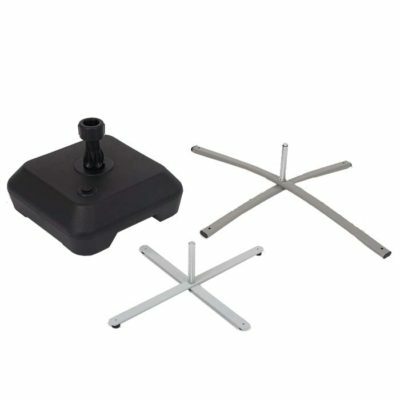 A selection of bases are available to suit every flag purpose. Depending on the size of the flag and for an easy to move flag, choose a large or small cross-base. Alternatively, secure the flag in grass with a spigot base, or to ensure this flag stays put, choose our heavy-duty base, which can be filled with water or sand. These bases are available for purchase separately or as part of your flag order. For more information on the bases available see the range here.